Large corporate advocate Chien has put out a propaganda paper. How nice. I wish we had someone paid to counter the propaganda like Chien is paid to produce the propaganda. Doesn’t even matter if it is pro-patent or anti-patent nothing in this paper can be trusted. If I read it and find ethical violations, there will be no consequence to Chien. This stream of rub ish that Dennis publishes on his blog should be seen as having no more credence than a blog post and as being paid for by large corporations. Who knows if Chien is misrepresenting the data. I know I could figure it out with a few hours of effort, but then I figure out she is che ating and what are the consequences? None. The large corporate advocate Chien continues about her merry way getting lots of money and saying whatever she feels like saying knowing there will be no consequences. The entire academic structure needs to be changed. Law professors are not “professors” or academics. They are large corporate advocates who work for the propaganda department of corporations. Patent Trolls are raking in the millions. You think they’d could throw a little money around for comments on IP blogs to trash academics based on insinuation and innuendo. Your version of “Patent Tr011s” is itself a myth created by those who rake in MULTI-millions. Sure, there be bad actors (what area of life does not have some? ), but please, let’s know when Kool-Aid is being served, who is doing the serving, and the desired intent OF that serving. You mean like these trashy pap ers the large corporate advocates produce? I’ve made specific complaints about her “papers” (probably a better name would be propaganda piece). No response from the large corporate advocate. And I have made calls for the PTO to tell us whether Andrei Iancu wears boxer. No response from the PTO. What could their non-response mean?!? Probably just residual delay in the system from the shutdown. Fyi, Iancu wears Batman underoos. Is that based on insinuation, innuendo, or an facts known to you? This made me laugh. Thanks for that. I hope you laughed, Greg, while reading a case that covers Constitutional law. Sound advice. One can never read too many constitutional law cases. In my experience, the 35 U.S.C. 101 issues are often, in practice, deferred to the end. While we get a 35 U.S.C. 101 rejections at the start of prosecution usually there are other, substantive (35 U.S.C. 102/103) issues that once resolved allow the 35 U.S.C. 101 rejection to be quickly disposed of. While there is a pretense that 101s are not dependent on the prior art the reality is that it makes little sense to say a non-obvious invention is convention or that does not represent an improvement to the the technology (if the specification is written correctly). It seems to me that codifying what is already in practice would be an easy change and probably decrease the size of responses because boiler plate responses and rejections based on 35 U.S.C. 101 would not need to be made until substantive issues have been resolved. Not only does it make little sense, it has nothing to do with the law of subject matter eligibility. I’m not at all sure what you were trying to say (I’d be afraid to guess) but the fact of the matter is that non-obvious “innovations” are routinely and correctly determined to be ineligible for patent protection. But the hammer is going to come down regardless. Because it has to. Pretty sure I’ve heard you say something similar in the run-up to every one of the smackdowns you received. Celebrating a broken score board does not fix the broken score board. Any — and I do mean any “smackdown” has zero to do with any reasoning provided by you because point in fact you supply NO reasoning in your celebration of desired Ends. Setting you vapid aphorisms aside, I’d like you to explain to everyone where the USPTO finds authorization to take public domain data gathering methods out of the hands of the public, should the public feel the need to think about the meaning of the data produced by those methods. Where’s the authorization to do that? It’s not coming from the Supreme Court, that’s for sure. The Supreme Court made it crystal clear in Prometheus v. Mayo that you could not do that. And that’s not even getting into the First Amendment issues. You attempt to ply a position already countered. Try something else. Your strawman needs to be retired. You ask for authorization of a phantom. Only you ever attempt that argument. That made me laugh as you have never gotten into the First Amendment issues in ANY meaningful cogent manner. Sure, you mouth a “concern” based on your feelings, but you have yet to actually form a cogent First Amendment / Patent Law intersecting position. Granting patent claims that purport to protect information, identified by content, where the information is the only distinguishing feature of the claim relative to the prior art, violate the First Amendment of the Constitution. Likewise, patent claims that protect correlations in the context of a prior art data gathering step (by turning people who “determine” the meaning of the data into infringers) also violate the First Amendment. In other words, the government can’t make it illegal for me to save information using a prior art information saving devices, and the government can’t make it illegal for me to correlate (i.e., determine a meaning of) data that I’ve gathered using prior art data gathering technology. The First Amendment exists to prevent that kind of cr @p.
What on earth is that supposed to mean, Billy? You STILL only “mouth” First Amendment. Maybe you should look at a few actual First Amendment cases and structure an actual argument based on the work done by actual attorneys. Your other replies are mindless and meaningless. Maybe you should find a First Amendment case that contradicts what I’m telling you, d I p s h I t.
How Fn typical of Malcolm – mouth some C R P and invite others to actually make his case (in a comment string that already point out your attempts to deflect any actual lifting). How about instead you do more than show your lack of legal ability in more than patent law, First Amendment law and most anything else having to do with law (here’s a hint: transfer all that time and energy of yours from whining about non-patent law items, and for that matter, throw in the time you spend purely whining about patent law matters, and build a cogent position based in more than your feelings. Perhaps – but not in the way that YOU intend. It’s not there according to the actual words of Congress. But if you accept the scrivining of the Common Law version written (not interpreted) by the Supreme Court, you do NOT have the luxury of dismissing the difference between conventional and the the more commonly known measures related to the state of prior art. The words used by the Court cannot be reshaped by YOU to make certain aspects that you do not like to disappear. That even worse than the disingenuous, Rule-of-Law disrespecting action of the Court itself, and is totally unmoored from any sense of “interpretation” (and we all know that you have no power of Common Law law writing at all). The process you describe is not real. If you are allowing the Office to not answer all of your arguments in each action (and then later paying by way of RCE to only then answer what should have been answered earlier), you have committed malpractice and owe your clients a refund. That is NOT to say that resolution of all issues happen at once, but you damm well better be pressing for resolution of all issues at every step. Anti-compact prosecution (no matter how ordered) seems like a non-starter when value is gauged solely from crossing the finish line and meeting all requirements. Additionally, putting the most subjective (read that as arbitrary, or Void for Vagueness) element as last in the process, after funds have already been expended, seems like the opposite approach to take EVEN IF some type of “ordering” were to be contemplated. This seems like a rather academic mistake. There’s nothing more “subjective” about 101, certainly not compared to 103 or 112. I don’t know which is scarier – that you think that others might believe your statement here, or that you might believe your statement here. By the way, you never did answer my question to you regarding Iancu’s direct comments on the contradictory nature of the Common Law law as written by the courts. It is this simply more reality that you refuse to see or acknowledge? Just clutch your blankie and keep telling yourself that you’re winning, Billy! It’s worked so well in the past. The most difficult word in the English language is “abstract.” That cylindrical object over there — abstract? Who can say. It’s impossible to know! The structure of this sentence — abstract? Total mystery. Unsolveable stuff. If X then Y. Abstract? You’d have to be Einstein to figure this stuff out. Protein of SEQ ID 24? It’s all Greek to me. Everybody has an opinion and they are all valid. Your response is simply nonsense. …and it should be noted that if these Court decisions did not align with your desired Ends, you would be screaming bl00dy mur der at the Means being used by the Court. I know one thing: no human mind, no abstraction. An interesting comment, given some of your recent views expressed (and not supported by you) on other blogs, Marty. oddly colored dice patented as a manufacture may be obvious, but not abstract. I see no lack of support there. Do you need the several links to PatentDocs? The lack of support is from a global statement that cannot coexist with your prior statements and your statement here (which prompted my comment here). While I can appreciate the potential posited benefits with such, I see a big prosecution / examination problem with any deferral of 101; namely, how would such deferral “fit in” with current first / second / final action practice? 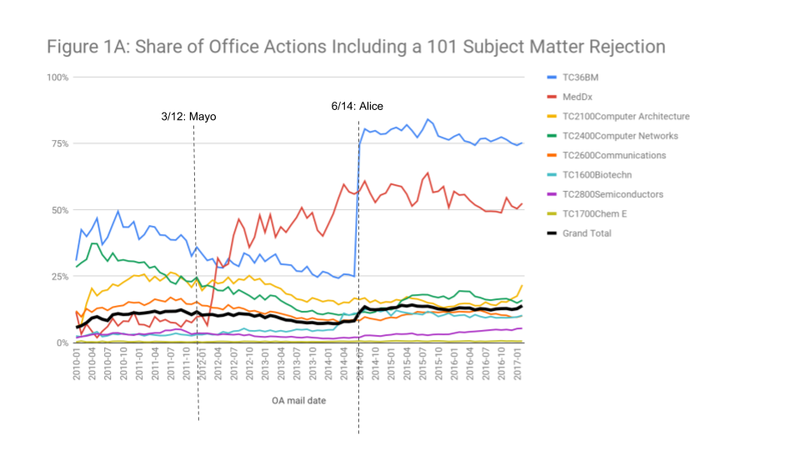 Would applicants be granted another action or two by the Office / Examiners in which to attempt to resolve / traverse any 101 rejections once 102 / 103 / 112 had been resolved / traversed? Because if not, 101 deferral is — and indeed must be — DOA. Would applicants be granted another action… in which to attempt to resolve / traverse any 101 rejections once 102 / 103 / 112 had been resolved…? Why should they? As Prof Chien is describing it, you must choose to participate in the deferral program. If you want to avoid the RCE fees associated with the 3rd or 4th OA, you may choose not to participate. If you choose to participate, there is no reason to expect the PTO to do extra work for no extra fees. The fact that the deferral program might cost more is no reason to pronounce it “DOA.” Some people are willing to pay more fees for more services, and others are not. Chacun à son goût. This is NOT a case of pay more for more services (given that the current payment INCLUDES all the necessary services vis a vis compact prosecution and the requirement for office actions to be complete. Instead, your “offer” is akin to paying the same for less services, then paying more for the services that you would have normally already recieved. Greg — sure, sure; under Prof Chien’s approach, one could choose to participate or not. Yet, how many inventors, companies, and other patent-seeking entities would be willing to pay the RCE fees … and accept the loss of patent term … all for the “opportunity” to wrestle with the patent office over 101? Far better to fight / traverse any 101 battle/s up front. I’ll bet that the patent office couldn’t even find 500 unique folks willing to test such an approach. For this reason alone this idea is DOA. In addition to Ben @ 2’s excellent point. 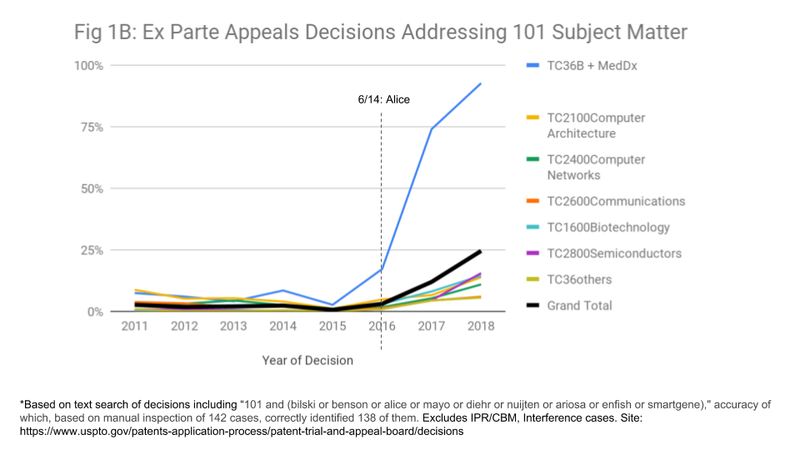 [H]ow many… companies… would be willing to pay the RCE fees… for the “opportunity” to wrestle with the patent office over 101? I am in-house counsel to a frequent application filer. If Prof. Chien’s proposal were introduced as a pilot program, I would definitely direct my outside counsel to opt to participate in some of the applications that receive the invitation to participate. In other words, I cannot say exactly how many, but I know that it would not be zero. I would track and compare the quality of the output from the participating and non-participating apps. Whether I would continue to participate after that test phase would, of course, depend on the outcome of the test. Whether the proposed pilot achieves a better process/outcome is very much an empirical question. I do not think much of this attempt to determine its value by ratiocination from first principles. Flash something shiny in front of Greg’s eyes, let him hear the words “different,” and watch him shut his own critical thinking down. Maybe you should not be in a position directing others in such matters, Greg (“frequent filer” or otherwise). Bad luck to be working on this article as the new guidance came out. No one is going to want to defer 101 while Iancu’s “consistency” is in effect. No kidding. Just ride the wave and collect your ineligible junk patent until the hammer comes down. Could be a month from now. Could be a day from now. Won’t take longer than half a year, though. Maybe a year at the outside. A couple quick comments. First, the restrictions on patent eligible subject matter are never going to be “eviscerated” by Congress unless we are truly ready to flush the entire country down the t0 ilet. Any member of Congress who proposes, e.g., that private individuals and corporations can own “correlations” and sue people (e.g., doctors or educated patients) who make correlations is a member of Congress who has no chance of re-election (exceptions, of course, for those places in Merka who will vote for whatever r@ cyst ped 0 pounds his/her holy book hard enough). The “controversy” was and remains not over those rates of rejection but over the claims that were (and still are in some cases) being granted without any 101 rejection and which were being asserted in high profile cases against people who were doing nothing except practicing the prior art and (1) thinking about the meaning of data; or (2) storing/transmitting/receiving/displaying specific kinds of data content. All that said, a workable plan to defer examination of 101 issues makes perfect sense if — and only if — (1) the analysis under 102/103 includes an effort to determine what structural elements in the claim were in the prior art or were obvious in view of the prior art and (2) the analysis under 112 identifies what elements are functional versus what elements are tied to objectively determinable physical structures. Otherwise what’s the point? What’s difficult for a tiny tiny tiny number of entitled people to understand is that (1) you can’t protect correlations with patents; and (2) you can’t protect logic and information with patents. Uncontroversial proposition (2), of course, upsets the Silly Con Valley Bros — who are collectively the most self-important t0xic @ h 0les in the world next to, I guess, Howard Schulz, Michael Bloomberg, and M@ngo H@irball. Your whining is as errant as it is insufferable. For all the reasons given so many times previously to your short and stale script.